Hon. Asibbey welcoming the Military Delegation to his office. 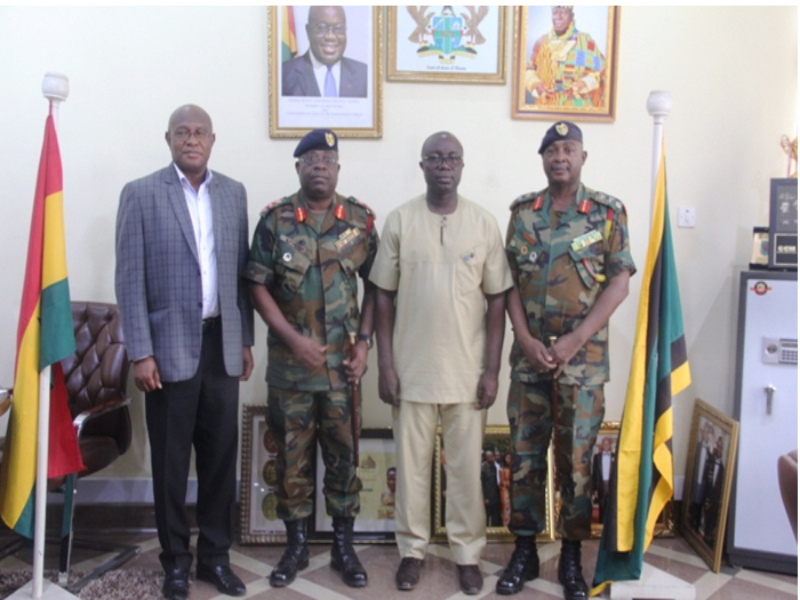 A delegation from the Central Command of the GhanaArmed Forces led by the outgoing General Officer Commanding (GOC), Brigadier-GeneralCosmos Alhassan,has paid a courtesy call on the Kumasi Mayor, Hon. Osei AsibbeyAntwi, at his office in Kumasi on Wednesday, 13th February, 2019. 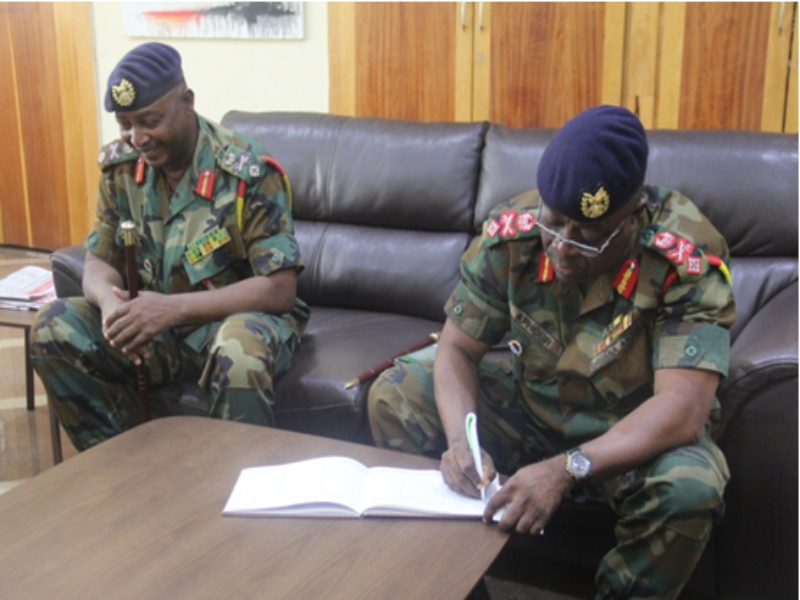 According to Brigadier-General Alhassan, the callwas to officially notify the KMA about the end of his tenure as the General OfficerCommanding the Central Command,and to also officially introduce the incoming GOC,Brigadier General Joe Aphour. The outgoing Brigadier-General expressed his gratitudeto the Mayor and the KMA for the support given him during his stay in Kumasi. He advised the incoming GOC to always respondswiftly to the Assembly whenever he was called upon for assistance. The incoming GOC, Brig. Gen. Joe Aphour signing the visitors book at the mayor’s office. Hon. Osei Asibbey applauded the outgoing GOC for hispersistent efforts and commitment to duty during his tenure. 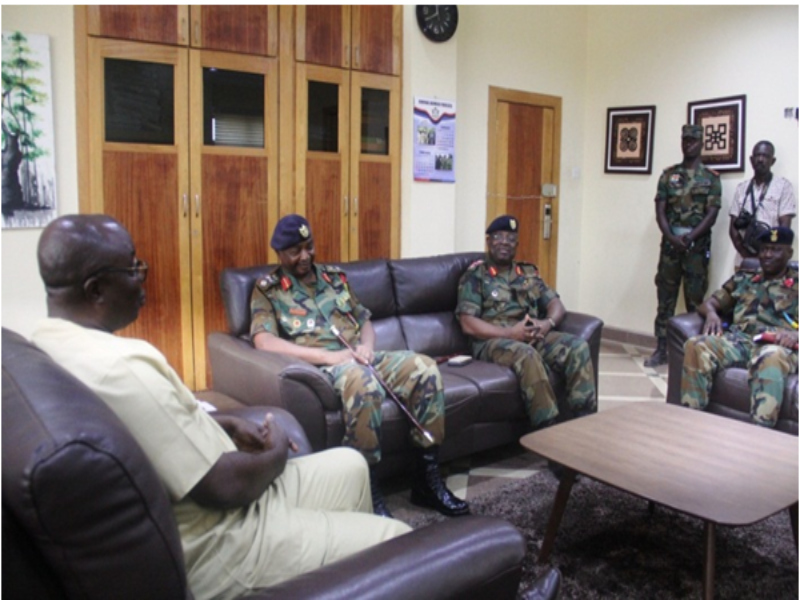 The Mayor called on the incoming GOC to enhance theclose collaboration that has existed between the Military and the KMA and addedthat the doors of the Assembly were always opened to the Military Command. Hon. Osei Assibey lauded the newly-posted KMA’ssecurity liaison officer, Capt. Daniel O. Brown,for his exemplary leadershipand professionalism exhibited in the ongoing relocation exercise at Kejetia. In his response to the incoming GOC,Brigadier-General Joe Aphour promised to work in close collaboration with theassembly in terms of releasing Personnel from his Command to support theoperations of the Assembly and assured the mayor that his men were ready todischarge their duties in a professional manner. From left, Mr. Michael Ataogye (MCD-KMA), Brig. Gen. Aphour, Hon. Osei Asibbey, and Brig. Gen. Cosmos Alhassan. What is: 10 + 8 ?